Teens take to the stage! A large crowd descended on the Headquarters branch for the Open Mic night, part of the Teen Summer Reading Club at the library. Eight performances showcased teens dancing, singing, playing instruments, and performing stand-up comedy routines. Many thanks to our host for the evening, Steve Baginski, the “Comedy Zone” Master of Ceremonies at IT’Z Entertainment City who kept everyone entertained between sets with jokes and magic tricks, and thanks to the performers and audience for their enthusiasm. 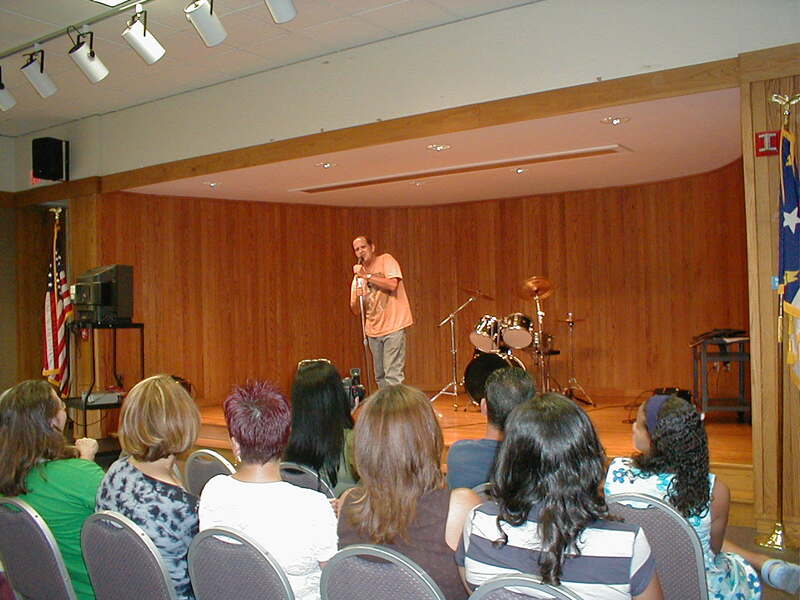 The next Open Mic event at the Headquarters branch, Grab the Mic @ your library, will be on July 27th at 7 pm as part of the 4th Friday festivities. Please check our calendar of events for more teen programs @ your library! From June 4 to July 31, head out to any branch library, pick up a Teen Summer Reading Club booklet, and read three books. Savor the implicit joy that comes with reading a tender romance, a rousing adventure, an intriguing mystery, or whatever type of book floats your boat. Take the log from the back of the booklet to any branch and receive a prize and a purple continuation log. Read three more books. Enjoy the use of your imagination, the exploration of new worlds or cultures, and the introduction to fascinating characters. Spin your mind into the crazy drama of high school angst. Embark on a quest fraught with peril, mythical beasties, and heroic deeds. Explore a new and interesting person, place, or time…not for school…just for fun. For yourself. Continue reading and filling out as many blue logs as you like. Every log (white, purple, and blue) will be entered into drawings, first at each of the local branches to receive a $25 gift certificate to Barnes & Noble, and finally one grand prize winner will receive a $100 gift certificate to the Cross Creek Mall. More details on the Teen Summer Reading Club can be found in the Teens Only section of the library website. Oh, and don’t forget to check out all the great programs for teens this summer. The library’s calendar of events has the most up to date information, and you can always call the location for more details. Check out the TeenZone game nights, the Fear Factor challenges, the cool craft programs, and the CSI demonstrations with the Cumberland County Sheriff’s Department. Come and hang out this summer. Read some good books. Learn a new skill or two. Make some new friends. Explore your world. Get caught up in a story. Solve the mystery @ your library.